When you work hard for your money, flaunting your achievements comes easy. Veteran comedian, I Go Dye, can be described as one of Nigerian's finest comedians. Having been around for over a decade, he is has maintained a healthy career in the Nigerian comedy industry. Just like the popular saying, hard work is indeed paying for the entertainer as amid many other properties owned by him is a mansion. 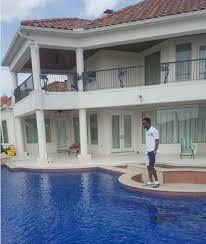 He recently left his followers on social media stunned after sharing a pool side photo in his ginormous house. Sharing the photo of himself standing by the pool, he wrote: "The only thing we owe each other is to love unconditionally." While I Go Dye is swimming in his riches, he however, has proven himself a benevolent man as well. He recently took to the social media platform to declared his intent to help recently evicted BBNaija housemate, Rico Swavey, in the pursuit of his restaurant business. Gushing over the housemate, I Go Dye disclosed the young man was able to project that he is a perfect gentleman, who is well cultured.